Back to the 5 ways. I love Mid-Spring, it’s a time when here in the UK that as a hobby gardener, I feel everything is rapidly growing. It’s a great time to take more notice. Gardening is very much my therapy. It’s a great way to nurture plants, enjoy the seasons, have all the senses used. Below is a selection of flowers from the past year in my garden. I particularly took notice just now, as this is the first time I have managed to harvest asparagus. People often are like Marmite with Asparagus, they either love it or hate it. For me, I love it. I love it for several reasons, one being that it is the one veg that I truly only ever eat when it is in season locally. Britains asparagus season is pretty short, usually from mid-April through to late May. Shipped in Asparagus loses its flavour rapidly, hence why I avoid it like the plague. My favourite way to enjoy asparagus is with eggs. The simplest way, is with a lightly poached egg, with the asparagus gentled steamed or boiled. However, I am not a huge fan of steamed or boiled asparagus. I think the next simplest way is to cook the stems over a hot griddle pan (with or without first oiling the stems). Cook until they start to char. Once they have stripes, take them off the heat. I like them to still have a crunch! I serve with a simple, homemade Hollandaise Sauce. You might be thinking, “Hey, hold on a minute, are I thought this was a 5 ways to wellbeing?”, but for me, you can eat rich sauces, and still maintain good general health. It’s all about the relationship you have with food. I know there will be some very health conscious people out there, who will say eggs and butter are not healthy (and I know some will come at this from a vegan angle too), but for now, I am still eating the occasional high-fat foods, but in small portions, and only occasionally. I think some fad diets, are much more harmful to a person, than getting the balance right. For anyone who does have difficulty maintaining a healthy weight range, then I can’t recommend enough Judith Beck’s book which is based on her Beck Diet Program (American English!). For most people who struggle with eating too much, it is often not what they are eating, or how much they are eating that is the problem, but more to do with the thoughts and feelings linked to food and their body image. Cognitive Behavioural Therapy can help overcome those thoughts and feelings. If you need more of a visual aid than my photos, or you are someone who likes exact measurements when following a recipe, then Google, Jamie Oliver or James Martin for recipe ideas. My method, in a clean wide bowl, add the yolk, mustard and vinegar. Whisk until all the 3 ingredients are blended together. Place the bowl over a pan of boiled water. Keep whisking, and add the melted butter slowly. The whole process of preparing and cooking takes me less than 10 minutes. Which is also plenty of time to cook the stems of the asparagus. It makes a great starter, before the main evening meal. I thought that there will be some cycle geeks who will be interested in what bicycle I will be using for my Coast to Coast ride. I think, this is the seventh bicycle I’ve owned since I was a child. It’s a Trek 920. I also have a MTB, but I don’t fancy riding 135 miles of road on that! The 920 is a workhorse of a bike, yet light as a feather (or under 13kg to be a little more precise). Its frame is aluminium alloy and comes with tubeless ready Bontrager Duster Elite 29er wheels. I am planning to replace tyres, as they are a bit too grippy for what I need, (although last weekend the current tyres were useful, as I went for a ride along a canal and the path in parts was muddy grass). It comes with very sturdy rear and front pannier racks. The combined maximum weight it can carry (bicycle, rider, and cargo) is 136kg. I am 80kg, and the bike is 13kg, which leaves me with a whomping 43kg worth of gear I can carry (although that is never going to happen)! Additional to the racks, there are also 6 water-bottle mounts (yes, 6 is not a typo). It comes with SRAM S700 shifters, 10-speed gears. This is the first bike I’ve had with SRAM tap shifters, and they have taken a little bit of getting used to. However, I have travelled around 200 miles now on the bike, and I am just about there with gear changing. This is also the first bike I’ve had with hydraulic disc brakes. I was alarmed when I first went out on it, as the brakes hardly worked. I thought I was doing something wrong, however, where I purchased my bicycle from, had swopped over the left brake with the right brake to make it more in line with the UK braking system (the bike had to be shipped in from mainland Europe – where the brakes are on the opposite side from what we are used to in the UK). This had caused air bubbles to get trapped in the braking fluid (some of you more technical types will be able to explain this far better than I can), causing the brakes not to function too well. However, the bike has been back to the shop, and it is all fixed now! The bike didn’t come with mudguards (fenders), although there are mounting points for full guards, nor did it come with pedals. For mudguards, I opted for Planet Bike Cascadia Fenders 29″ x 65mm. They were easy to install. The only downside to them is that they don’t have any hi-viz elements to them unlike some other mudguards that I had seen, however, they did come highly recommend on various websites, including Adventure Bike Touring who happened to write about the older version of the Trek 920. As for the pedals, I took the plunge, I have finally gone clipless! I got myself a bargain in the January sales, with Nukeproof Horizon CS CrMo Trail pedals. They (as would any clipless pedal) took some getting used to. Thankfully, YouTube gave me plenty of hints and tips. I’ve only had one embarrassing moment when at a junction, I forgot to clip out and fell sideways. Thankfully for me (but not my son), I was riding with my boy, and he cushioned the blow for me! As for the extras. Well as you can see, I have added a horn/light on the handlebars. It is a Hornit, claims to be the loudest mass-produced bicycle horn available. And it is loud. Very loud. The problem I have encountered though is that people (pedestrians, car users, other cyclists) don’t recognise it as a bicycle horn (it sounds more like a car alarm), so no one moves out of the way! For that reason, it is the only item in this blog that I wouldn’t recommend. However, the light is pretty good, certainly good enough for commuters. I have a small Oxford alarmed D-lock. It’s just big enough to go through the frame, and loop around most bicycle shelter stands, as well as through a long reinforced bicycle cable that I carry to loop through the two wheels. The alarm is very loud, and would make a bike thief have second thoughts of robbing me of my pride and joy. I have also mounted a few bottle cages on. The black bottle is actually a handy little container for tools. If you read the reviews for the bottle/tool container, a lot of people complain that everything inside rattles (tools, tyre levers, etc. ), however, I stuff a few disposable latex gloves in and that stops things moving inside, plus keeps my hands clean if and when my chain comes off or tyres need replacing on the roadside. Another cool little gizmo is the Quadlock. Easy to install, and basically is a mount for a smartphone. Given how much I use Cyclemeter and Strava, and have a TomTom Bandit camera mounted to my helmet (but it can be turned off and on from my phone); Quadlock is a handy little kit. Part 2 will focus on the panniers and their contents. The 50 to 75 mile section looks, erm, interesting! So here it is, the route for anyone interested in seeing where I am going, how steep the hill climbs are, which villages I will be passing through, etc. For those of you with a bicycle, if you want to share part or all of the journey with me, do get in touch, and I can give you dates, and estimates of where I will be at different times of the day. For those of you who would like to sponsor me to help raise funds for the Cameron Grant Memorial Trust, my TotalGiving page is now up and running. As you can see above, the total distance is 135 miles. Apparently, it will only take 15 hours and 53 minutes, if I average 8.5mph (this is based on “average” fitness). There are some significant hill climbs, and they will be a real challenge, especially with accumlative days of riding, and having aches from the day before! I have used Komoot to set the route. For those of you unfamiliar with Komoot, it is basically a satnav for cyclists. It’s very good as it can even set routes for mountain bikers. You can set your starting point, set your end point, and what type of cycling you are doing (e.g. touring, road race, MTB, etc.) and it plans your route for you. There are also options to edit the route manually. I’ve got my accommodation booked, but I am looking for suggested places to stop and eat for lunch. If you know any cycling friendly cafes or pubs on route, let me know in the comments section on this blog. Also, do you have any recommendations of snacks to take for along the way? Just a quick post today. The fundraising for the Cameron Grant Memorial Trust page is now live, and it can be found here. Any contributions will be welcomed – no matter how small or big, please do donate to this worthwhile cause. It is all feeling very real now. 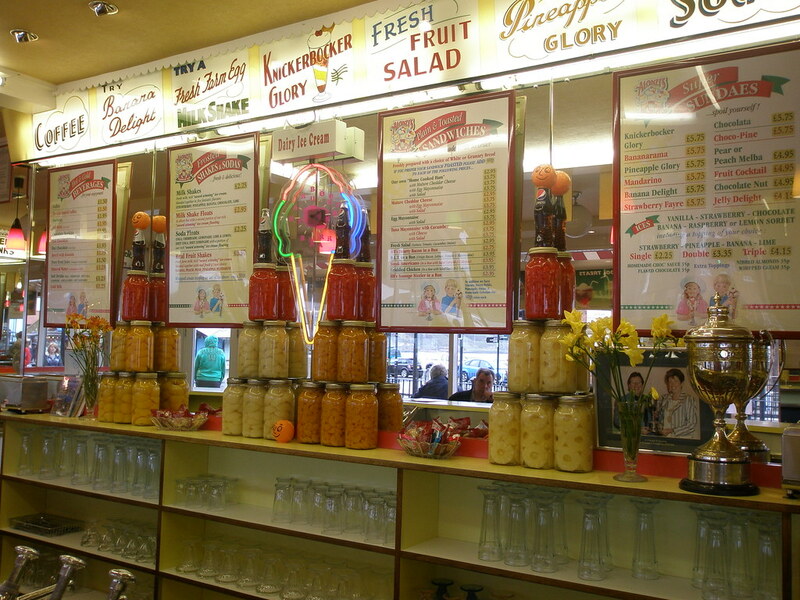 135 miles (as long as I don’t get lost), starting at the Eric Morecambe statue, in Morecambe, and ending at the Harbour Bar in Scarborough for a well deserved knickerbocker glory! If you’ve been following my blog, you will know I am looking to cycle the route over 3 days, and I have now booked my cyclist friendly accommodation. First night stay is in Burnsall, and the second night stay is in Sheriff Hutton, before making my way to Scarborough via Thornton-le-Dale. I will rest my weary legs in Scarborough overnight, before returning on the train via Leeds. Just to give you a heads up, this post will talk about mental health and wellbeing, and suicide. If you are feeling vulnerable at this moment in time; maybe bookmark this post for a later date, when you are feeling a little stronger. Please do check this page on where to get support for your mental health, should you need some help right now. I’ve worked in health and social care for 25+ years. Over that time, I have worked in acute learning disability services, substance misuse services, sexual health, HIV+ community drop-in, care leavers supported housing, and youth work project. In the last 15 years or so, I have worked in mental health services in acute child and adolescent, and also in acute adult services within the NHS in both metropolitan and rural areas. More recently, I have worked in university campus-based services within student support, initially as a mental health adviser, and currently, I am now a manager of a Mental Health and Wellbeing Team. I love working with students, they are such a diverse bunch of people. There are stereotypes of students that still persist from the 1960s that they are all on the radical left, and protest lots, and smoke copious amounts of cannabis, and drinking Real Ale. This stereotype has remained in the public eye through the 1970s and ’80s and exacerbated with the BBC comedy “The Young Ones“. But the reality is that the stereotypes are just cliches and oversimplified beliefs that we have of others. The reality is much more complex. Students are by enlarge in the 18-21 age bracket, but many more adults are returning to education later in life. I myself didn’t go into Higher Education until my late 20’s, and I was very much the first person to do so from my immediate family. Like most other students, I enjoyed university life; the studying side, as well as the social side. However, for many students, university can be a difficult period in one’s life. For traditional undergraduates, it can be the first time living away from home; it can be isolating, bullying in halls can occur, being away from family and friends and other support networks. For other types of students, it might be having to give up a good income, caring for children on top of studies can also be quite a challenge. For most students, it will be the first time that they have really had to think differently, to be more critical. There will be some students who have additional difficulties, such as coping with a disability, including a mental health condition. Indeed, over the past few years, there has been a significant increase in the number of students declaring they have a mental health condition, and this has been well documented in various reports and good practice guides in recent years. In the 2017 IPPR report, “Not by Degrees“, Thornley identified a five-fold increase in the number of students declaring a mental health condition. There could be a whole range of reasons for this increase, partly linked to the stigma of mental illness slowly being eroded, partly because the awareness of the range of support for students with disabilities (including mental health conditions) is becoming more known, and other reasons will also exist (but that will be getting political, so I am going to leave it here for now). There has also been an increase in student suicides in recent years, and there has been some Suicide-Safer Universities guidance from Universities UK and Papyrus on how university leaders can work towards preventing further suicides. This is something I was particularly interested when it was first published. Surprisingly, it isn’t as researched informed as one would hope, but it is certainly a step in the right direction. What we do know about student suicides is that they have increased in recent years, however, students are at no higher risk than other adults outside of the higher education sector. We also know that around 80% of students who take their own lives are not known to specialist counselling or mental health support services. This isn’t unique to the UK but is known to be the case in the USA too. But those students who do die from suicide, are known to someone, a peer, a tutor, a residents life officer, a librarian, a receptionist, etc. Can training non-clinical staff help? Gatekeeper training (as it is collectively referred to), is often recommended by many good practice guidelines, including the suicide-safer universities guidance listed previously, and in other guides, such as the Universities UK #StepChange . However, very little is known about the benefits of rolling out such training, and equally, we don’t know what risks can happen with such training. We know that some of the students who die because of suicide often faced barriers to accessing help. Examples of barriers include ambivalence regarding treatment outcomes from specialist services, and also the stigma associated with accessing counselling, psychotherapy, or mental health services have been documented by Czyz et al (2013), long waiting times have been identified as a barrier by Arria et al (2011), who also found that poor knowledge of where to get help, is also a barrier. It is that last point that I want to pick up on, with regards to the Cameron Grant Memorial Trust, and the Cameron Coasters. Anyone who has ever worked in a campus-based counselling service will know that promoting the service can be quite a challenge. During Freshers Fairs, when young eager and bewildered students first arrive on campus, the vast majority are usually wanting to find out which bars in town have the best offers, where they can get a free pizza, and the what, where, when of their first lecture. Very few are interested in a talk from the counselling service on how to get support if they are struggling emotionally, and the leaflets often end up in the bin. The Cameron Coasters is a bit of a game changer. Not only are they informative, but they have another use! They can prevent a coffee/beer stain from forming on your desk whilst you work (or watch another box-set on Netflix/Amazon etc.). You might be excited to have started your undergraduate/postgrad/PhD studies, but if things take a turn for the worse later on, then the coaster might be there. It might breakdown one of those barriers to accessing support (namely, knowing where to get such support). For those of you who haven’t seen my previous posts about the Cameron Grant Memorial Trust, they are a small charity set up by Carol and Evan Grant. Their son, Cameron, died by suicide in 2014 whilst a student at University. Carol and Evan came to the University of Cumbria where I work, around 18 months ago to talk to staff and students about Cameron, and the work they now do for the charity. They also produced, and then printed thousands of Cameron Coasters for the University of Cumbria, for free. They have produced thousands of coasters for various organisations including schools, colleges, universities, and police forces across the UK. Anecdotal evidence has suggested that students and staff at the University have found them invaluable, to hand, they have the details of how to get support on and off campus. Moved by Cameron’s story, and the charity’s generosity, I decided to fundraise for them. I raised a small amount on my birthday via Facebook, but now, I plan to ride the Coast 2 Coast this summer to raise more money for this worthwhile cause. Don’t worry, no Gantt Charts here (although I did consider using them at one time). I thought it might be useful to give you an idea of how I have planned my route to date. In this post, I will show you the routes I considered and opted for, the accommodation I plan to stay in overnight, and what tech and gear I will be taking with me. The route. Straightaway I decided upon the Way of the Roses route (or a variation of the said route. The first reason is that I live close to the traditional starting point of the Eric Morecambe statue in Morecambe. It takes about 20 minutes for me to cycle to the starting point, and then I have to almost double back on myself. I am about 95% sure of the route I definitely want to take, I am still deciding on a particular stretch in the middle of the Yorkshire Dales – the dilemma being, do I go on quieter roads, but with much steeper hills climbs, ongoing on trunk roads that are a little flatter but with busy and faster motorised traffic? The initial few miles are straightforward; along an old railway track that has been converted to a footpath and cycle route, that heads west out of Morecambe to Lancaster and a few miles beyond along the River Lune valley. From there it is an assortment of country lanes, B roads, and A roads into Yorkshire, and the Dales. This is where I am yet to finalise the route, but the third section will take me through or near Skipton, Ilkley, Harrogate, York, Malton, Pickering, and the Scarborough. I am using Komoot to plan the route. It’s basically an online route planner for cyclists. I initially considered camping along the route, but having spoken to a few people, they have swayed me more into thinking about staying in Pubs, youth hostels, or B&Bs. There are some positives to camping, such as being less restricted to when/where you stop – so if you are making good progress, keep going, or if you are getting tired, stop and pitch up. The downsides are of course more obvious, not great after a hard day in the saddle of then having to put up a tent, weather can be a challenge (too hot, too cold, too wet, too windy), and also the additional weight that you have to carry on your bike. I haven’t completely ruled out camping, but I think I would want to have a mini practice run of camping somewhere close to home that I can cycle to, and have an overnight stay in. For those of you interested in camping with a bicycle, then I can strongly recommend looking at Jon and Franks cycle touring webpages. I got some great tips for gear from there, and also things to consider such as distance per day, etc. One of the things that became apparent fairly early on through discussions with those who had undertaken long-distance cycle routes is the type of bicycle makes a big difference. This, of course, is obvious – you wouldn’t want to cycle on a traditional shopper bicycle or a BMX for example on a long distance route (unless you were looking to show off)! It is possible on a mountain bike, but not ideal. Of course, I have a hardtail MTB, and it does have a pannier rack on it already. I also had a very old hardtail that was becoming a bit of a rust bucket has not had much use out of it in 15 years. At the beginning of 2019, Wheelbase had a great offer where you could trade in any old bicycle in any condition, and they gave a significant discount on a new bike. Choosing which bike became another dilemma. There are so many bicycles out there it is hard for a novice like me to work out the best options. However, the internet is a brilliant invention, and I read review after review after review. Getting unbiased reviews (e.g. reviewers who haven’t been given freebies) is a challenge, but a challenge that I worked my way through. I didn’t want to get a bike that I was only going to use just for the C2C (and I had seen bicycles on eBay that were being sold after just 200 miles use). I decided that I wanted something that would be good to commute to work (so pannier racks needed – which would also be needed for the C2C), go for pleasure rides with my son (something that could go on road, as well as canal towpaths, bridleways etc. ), and something that be great for camping trips for in the future. This narrowed down the field to either a strong touring road bicycle or an adventure bike. Further advice was sought, and I narrowed my choices down to two or three. I got the chance to test out two and opted for the Trek 920. It’s very light for the class of bike, it has front and rear pannier racks as standard, 6 drink bottle holder mounting points (although that seems excessive to me), it looks like a hybrid meets road bicycle, which makes it great for the shorter rides I do with my son, and I found it a very comfortable ride. I’ll no doubt be writing further about this bike in future posts. In terms of other gear that I have bought for the trip, but will no doubt use in other ways have included Ortlieb Back Roller Plus and Ortlieb Sport Roller Front panniers. In part, I got these for the trip, but also for my commutes to work. They are waterproof, quick and easy to mount, and have very good ratings on many review sites. They were also mentioned on Jon and Franks website (see above). They are not the cheapest panniers, but if you shop around, you may get some during the sales (I got my front panniers with 33% off the RRP through a New Year sale). When I finalise my plans, I’ll post again. I’ll also post more about the equipment I use. If you’ve any recommendations on tech or equipment recommendations, let me know. Is this post, I am going to go a little more into detail about the stages of change, and how you might want to consider this if you are thinking of improving your health in someway or another. As mention in my previous post, I have been mindful of the Transtheoretical Stages of Change when it has come to improving my physical and mental wellbeing. 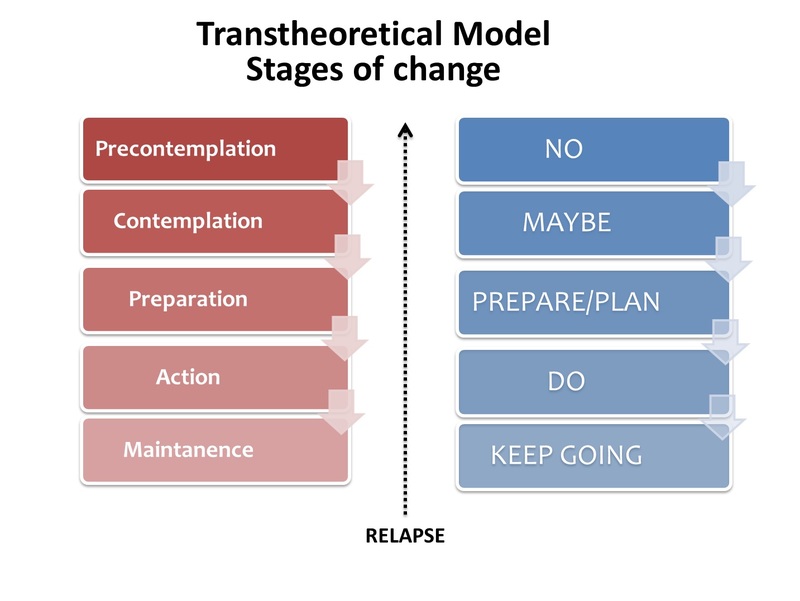 The Transtheoretical model has been used in sport and exercise, weight loss or dieting, reducing or stopping alcohol use, other types of substance misuse, and smoking cessation. Putting what I have learned in my professional practice, into personal use, hasn’t always been straightforward. Giving up smoking several years ago, is a classic example, I didn’t do any preparation, I just decided one evening that I had had enough of smoking. I just put a cigarette out and stopped. Not smoked since. With regards to the current plan, and the aim to get fit, when I was in my Pre-contemplative phase, I didn’t really consider my health needs. I got up each morning, did what I did, and didn’t give my health a second thought (other than the occasional manflu, or if particularly ill, bad bouts of manthrax, where I would moan about my health to anyone too unfortunately to escape). I hadn’t really noticed my weight had increased, I put down the expanding waistline to “middle age spread” like it was out of my control. To summarise, pre-contemplative phases tend to be when a person sees no need to change, the “What problem?” phase. They may be in denial, or the thought hasn’t even crossed their mind. Think, “Head in the sand“, and you’ll catch my drift. The Contemplation phase occurred when I had my NHS health check. This was my wake up call. I had a fairly high blood pressure (something I had historically never had), and I also hadn’t realised just how much weight I had put on (as mentioned in previous blog posts, I was historically tall and underweight). I was at risk of developing Type 2 Diabetes, and that was the most alarming moment during the health assessment. This is when I started to think about my options. Do nothing, but that would likely see my health deteriorate, along with the quality of my life. Do something, but what. The practice nurse who assessed me went through various lifestyle changes I should consider, although to be fair, I knew them all (reduce saturated fat, reduce drinking alcohol and caffeinated drinks, do more exercise, etc. ), it was just that until that point, I had never done anything about them. Classic examples of contemplation include those who know they are drinking too much alcohol, but they think it helps them sleep at night – most of us would not see this as ideal, but for some, they think the negatives outweigh the positive. Maybe further down the line, a heavy drinker might consider healthier options for sleeping. It’s all about doing a cost-benefit analysis. This is not Morecambe Bay! The cycle to work scheme was my call to arms. It pushed me into the Action phase My son really enjoys cycling, and I thought this was something we could easily do together. I got myself a hardtail mountain bike, and we started to go for little rides along canal paths, cycle-ways, bridle tracks, and quieter country lanes. I also started to cycle to work, but I have to admit, I was very much a “fair weather” cyclist. Living in the north-west of England, meant that dry cloudy days are rare, let alone sunny days. I still wasn’t getting the full benefits of exercise. I need more motivation. The Cameron Grant Memorial Trust, has been that additional boost that I needed. I decided that I was going to raise some money for them through a sponsored cycle ride. Action phase is very much the phase where you know you have a problem behaviour or issue that needs addressing, you reviewed and prepared your options, and you have now started to modify or change your behaviours for the better. There are various recognised routes for the coast to coast. I think the original route was developed by Alfred Wainwright, for walkers, but other routes have been created, including the Way of the Roses. I am doing a variation of the Way of the Roses, and more of that on another time. I’ve really started taking the cycling more seriously, to the point that I am turning into the dreaded MAMIL (middle aged man in lycra), I’ve got cycling apps, got padded pants, started to watch Youtube clips for ways to improve technique etc.. I’ve been riding with my son, on my own, with pacesetter Nigel, and anyone else who wants to ride. I have gone from seeing 10 miles on the flat as a long route, to recently cycling 41 miles uphill and down dale (still a small jaunt for more seasoned cyclists, but for me it was a significant benchmark). I need to keep in mind that the coast to coast is 120+ miles (depending on the final route), and the Pennine hills are a big obstacle to overcome. I am not, in anyway going to kid myself and think of doing this in one day, and apparently it can be done in 6 hours! I am thinking of 3 days (2 night time stops on route). I am practicing where I can, and now it is Spring, and the days are getting longer, I will be able to get some further practice in, during the evenings. The great knock on effect of this, is that I am getting fitter (I’ve lost a few kilos since starting), and my sleep is improving (due to being knackered), I am also feeling my mental wellbeing is improving. Doing exercise releases serotonin and dopamine in the brain which is linked to improved mood. I am in the process of finalising the route, and I will keep you updated on that in future posts. If anyone wants to join me in part or all of the route, do get in touch. Connect – connect with the people around you. It could be family, friends, colleagues, peers, neighbours. In your place of study, workplace, or local neighbourhood. Increasing your connectivity (in real, not necessarily through social media) has been shown to improve your mental health. Isolation is a significant risk factor for developing poor mental wellbeing. Be active – much of the point of my blog is around increasing activity to become fitter. Even simple forms of exercise has been shown to improve mental health. A walk in the local park, going for a bicycle ride, doing some gardening can make you feel better about yourself. The University of Cumbria’s campuses are all close to local parks, go out and get to know them if you are studying there. The University also has Green Minds, a project to encourage staff and students to do some basic gardening, which is great for being active, but also for connecting with others. 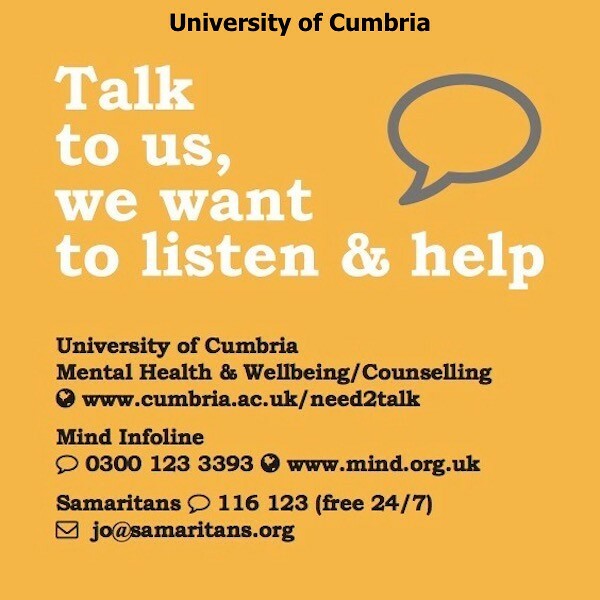 If you are reading this blog, and not a staff or student member of the University of Cumbria, may be see what is going on at your work or place of study. Take notice – gardening is another great way to do this. Get in tune with the seasons. Savour the moment. Reflect on your experiences, and this will help you appreciate what really matters. I am a keen gardener, and I do enjoy watching the seasons come and go through what plants are blooming in the garden. I also over the years, have enjoyed growing fruit and veg, and strive to eat seasonally. In fact, this is one of my favourite times of year, as one of my favourite vegetables is just coming into season, and it will also be the first time that I will be able to harvest my own crop of Asparagus! Keep learning – of course, if you are a student, then hopefully you will be learning all the time, but also try something new or rediscover an old interest. As part of my coast to coast ride, I have started to learn basic cycle maintenance, and how to improve my cycle ride techniques. Thanks for joining me! This is the very first post, it’s not much to look at or read, but I just wanted to get something posted, anything. For those of you interested, the picture below is looking towards the Trough of Bowland from the church just outside of Abbeystead. Having gone for a quick practice hill ride with my friend Nigel. The ride route for anyone interested, starting at Williamson’s Park in Lancaster, we cycled through the Lancaster campus of the University of Cumbria, down to Lancaster University, Galgate, Dolphinholme, Abbeystead, back via Jubilee Tower and Quernmore. According to Strava, the ride was 21.02 miles long, and elevation gain of 1704 feet. Practice for my C2C, Way of the Roses alternative route.